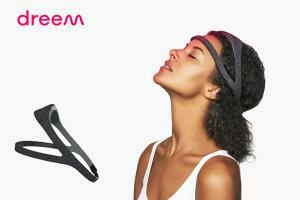 Dreem Headband Review: Accurate and Effective, But Is It Worth the Price? The Dreem sleep headset was developed by Hugo Mercier—the founder of the French startup, Rythm—and Quentin Soulet de Brugière. The idea came to mind when they learned sound stimulation could effectively improve deep sleep. This led them raising over $11 million to fund their prototype—which led to the final product, reviewed here. Through extensive research, they were able to produce a product whose accuracy is proven by a clinical trial. While the product isn't perfect and has some downsides, there's no denying that it's built on science-based sleep knowledge. So, How Comfortable is It Really? At first glance, I found the Dreem band would be both comfortable and easy to use. It's made of high-quality, breathable fabric and foam with built-in sensors to track your sleep and deliver sounds that will help you sleep longer and deeper. You can tell a lot of time and effort was put into the product, and its minimalistic and lightweight design proves the developers had both comfort and overall effectiveness in mind while designing the Dreem sleep monitor. The purchase of the Dreem band comes with a great travel case and additional accessories that help you get the most out of your Dreem band. Since no sleep tracker is perfect, I found there were both positive and negative aspects to the Dreem Band, take a look below to learn more! The Dreem band is designed to be easy to use and comes with a thorough manual, so you don't have to worry about any unanswered questions. The elastic band makes it easy to slip on and ensures you have most users have a secure fit. The Dreem also has an app where you can track and record everything. It allows you to see your brainwaves in real time, which I think is a fun feature that other sleep trackers don't offer. This allows to visibly look at your progress and make necessary future changes to improve your sleep. One of my favorite features about the Dreem band is the sound stimulation it offers—and which we will talk about more in a bit—via 2 bone conduction transducers, although you have the option to use earplugs if you prefer. You will find the earplugs produce a much more clear and vibrant sound—I wasn't a fan of the sound the quality without the earphones, but this will depend on your preference. How does Dreem use Bone Conduction System? I think the touchpad slider makes the Dreem band easy to control and adjust—but you will realize the battery life can be frustrating to deal with. You have to recharge it daily since it will only last the night, so if you forget to do this before bed, you won't be able to track your sleep that night. Before delving into how the Dreem band works, let's talk about what the Dreem band does. Most sleep trackers on the market are designed to do just that—track sleep. The Dreem sleep band, on the other hand, will not only track your sleep but also provide you with tools and data that will help you improve your sleep over time. The Dreem techniques involve a combination of relaxation, sound stimulation (which enhances the quality of deep sleep by delivering pink noise), and the use of an integrated smart alarm. The makers of the Dreem band drew upon validated techniques when they decided to incorporate these features into the band—and from experience, I know they work when used correctly. Dreem effectively combines these four techniques through the use of guided meditation, breathing exercises, background sounds and cognition (a technique used to distract the mind by repeating a sequence of words). You can set this up to help you fall asleep and have access to tons of material to choose from through their app. I benefit a lot from the sound when I am trying to fall asleep, so this is one of my favorite features. Many users have noted these features are great at helping them fall asleep and calming their restlessness and anxiety, but many have indicated their dissatisfaction with the sound quality. While earplugs improve the sound quality, many of you may wish you could get the same quality of sound without them. Furthermore, while I'm a fan of the cognitive exercise the device offers during the night, many users complain it disrupts their sleep during the night. The smart alarm, on the other hand, is a great addition because it will wake you up gradually, at the right time—although it's not something that will help you an efficient power nap if that's what you 're looking to do. However, the company is currently testing a napping feature, which will soon be added to the app! Overall, the sleep alarm will effectively track your sleep cycles and gently wake you up during the light sleep stage. Arguably the most effective attribute the band offers is the use of the Dreem Coach—which you can access through your Dreem app. This tracks your sleep data and gives you access to more personalized sleep training that will help you get your best night's sleep. While the Dreem Coach can help you achieve your best sleep, it's important to remember that you should not expect immediate results. The Dreem Coach will provide accurate information that will prove to be effective—but when it comes to efficiency, it will not solve all of your sleep problems in the wink of an eye. The Dreem headband is designed to use all this sleep data to improve your sleep over time as well as help you understand what factors affect your sleep quality. So, will it really improve your sleep—let's look at the facts. The Dreem band was specifically designed to help you improve your sleep. Its developers considered many factors when designing the Dreem band and the following clinical trial backs up the accuracy of the product. A clinical trial, completed in Paris, was designed to gauge the validity and accuracy of a beta prototype of the band. Over the course of 3 months, a double-blind clinical trial ran its course to assess the results of three variations of use during sleep—with synchronized auditory stimulations, no auditory stimulation, and random auditory stimulation. The results of the trial confirm not only the Dreem band's accuracy but also how effective it is at detecting sleep. Currently, two ongoing clinical trials are testing the accuracy and effectiveness of the Dreem band. Specifically, one of the trials is designed to assess the effectiveness of the band's sleep staffing component, and the other will be testing whether or not it can evaluate/detect/address sleep apnea in users. Both trials should be posting results in the near future since they were estimated to complete towards the end of 2018. You can read more about the science behind the Dreem here. Overall, the Dreem Band provides accurate results and tracking thanks to the use of 3 different sensors—EEG (monitors brain activity), Pulse Oximeter (monitors the heart rate and oxygen saturation in your blood), and the 3d accelerometer (monitors your breathing and movement). The use of EEG monitoring makes it more accurate than non-EEG monitoring, such as the accelerometer based and Ballistocardiograph based methods of measuring sleep. The first of these two rely on movement—so if you're a restless sleeper, you will not receive accurate results—and the latter is based on your heart rate. While heart rate measurements will be a little more accurate, your heart rate may fluctuate for different reasons, and the device may confuse the fluctuation for a change in your sleep. EEG monitoring—like the Dreem band employs—uses your brainwaves to track your sleep and detect changes in your sleep patterns. The completed clinical trial, which I referenced at the beginning of this section, validates the accuracy of this “at home” EEG monitoring device. Here is a a quick sum up of clinical trials done by Dreem with Hôtel-Dieu. Before diving into this topic, it's important to note here that version 2, the new and improved version of the original, brings improved sensors that are more flexible and comfortable. This was done to address the comfort issues in the original, which we will mention below. While the Dreem band was designed to be comfortable and fit most heads, I have found this isn't the case for everyone. Dreem uses several sensors, embedded around the band, to track and examine your brain activity while you sleep. These sensors can prove to be uncomfortable for some people, and many users have complained it's so uncomfortable that it wakes them up in the middle of the night—further disrupting their sleep. The Dreem band is also marketed to fit most heads—so, if your head happens to be a little too big or too small for the device you may find it frustrating to put on and take off as well as even more uncomfortable then it will be for other users. Overall, while the Dreem band makers set out to design a comfortable product with a universal fit, some users have found that it doesn't fit them appropriately and that it's uncomfortable. While this isn't the case for everyone, I highly suggest you take advantage of the company's 30-night sleep policy —which allows you to return the band if you aren't satisfied. This policy is one of the company's greatest perks because you just don't know how the band is going to fit you(keep in mind that you pay the shipping cost). The Dreem Band is pricey, to say the least. I can argue that the accuracy makes it worth the cost—but I can also say that it may prove to be too uncomfortable for you, and even negatively affect your sleep in the long run because of it. When comparing it to similar products, like the Phillips SmartSleep or the Sleep Shepherd Blue, you might find that a different option may be the way to go. The Phillips SmartSleep is sold at about the same price but it doesn't have any features designed specifically to help you fall asleep (like the Dreem's breathing, meditation, and cognitive exercises). However, the Phillips SmartSleep uses 2 sensors, instead of 6, that are adhered to the band. While this does make the headband more comfortable than the Dreem band (which uses built-in sensors) you'll probably end up spending more money in the long run since a pack of 30 sensors cost $29.99—and you'll have to replace each sensor after three uses. On the other hand, the Sleep Shepherd Blue is more affordable and has studies that back up its effectiveness and accuracy. Instead of cognitive exercises, this one uses Binaural beats—which would resolve the distraction and annoyance some users report with the use of words (which sometimes wakes them up). But I can't recommend this product since it has not been on sale lately. While Dreem is a great product (that still needs some improvement), I think it could benefit from compatibility with SDK (Software Development Kit). This would probably increase its sales because it will allow outside developers to make apps that will work for the device. Nowadays this is a popular commodity that tech lovers really enjoy. Best Sleep Tracker Reviews - Which Sleep Monitor is Best for Me? In the end, the Dreem band will provide you with accurate tracking thanks to the use of EEG sleep monitoring combines with its heart rate, movement, and breath tracking. 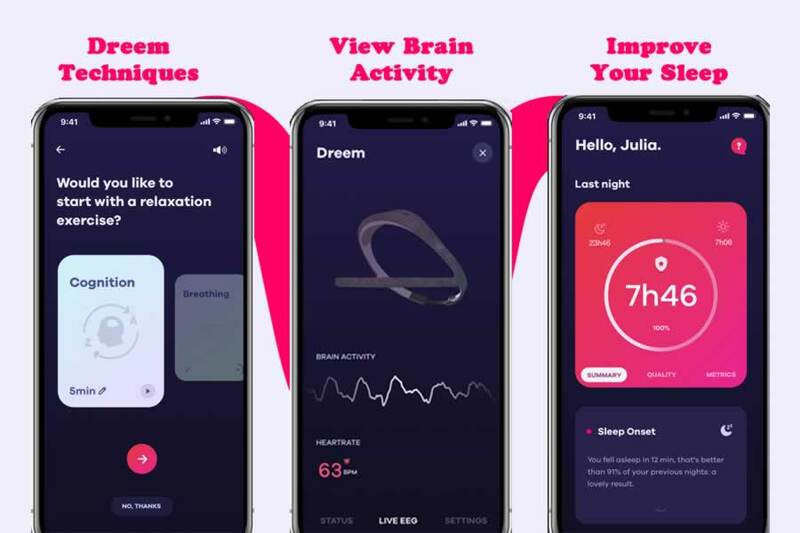 It comes with access to an app that is compatible with iOS and Android device that grants you access to the Dreem coach—which uses CBT programming and allows you to personalize a sleep program that will address your needs and help you reach your optimal sleep goals. Its use of Dreem techniques helps you get to sleep with the help of sounds, exercises, and cognitive simulation—the combination of these three things is proven to help you sleep better and longer. The company's site, and its manual, comes with all the information you need, and the 30-day return policy will let you test it out and see if it's the right device for you—so don't have to worry about getting stuck with a product you hate. On the downside, the biggest complaint about the Dreem band is how uncomfortable it is—so you will just have to see if it fits you properly or if you can get used to the built-in sensors. However, given that you can return it, I definitely recommend you give it a shot since it is proven to be accurate and its methods are effective (you will have to give it at least 5-7 nights regardless to see a difference, regardless of your comfort levels). If you are serious about getting the most accurate results, the Dreem band is it—but you may have to sacrifice comfort in the beginning. Although the Dreem band is expensive, if you don't mind having to recharge it every day and can get around the sound quality (I admit, this is a personal taste) then the Dreem band deserves a shot if you want access to accurate data that will help you understand where your sleep problems lie, and how to improve them.